Riesling grapes love our Finger Lakes climate and produce a wide variety of delicious wines. Twenty years ago, dry Rieslings were very rare. 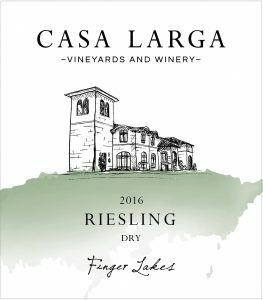 Since then, our Dry Riesling has made its mark and become one of the Finger Lakes region’s “new classics”. Harvest dates. Various in October 2016. Viticulture notes. Each vine was hand-tended to enhance sun exposure and fruit ripening. Crop levels were closely controlled to allow the fruit to express maximum aromatic intensity and complexity. Winemaking notes. Small lots of grapes were selected from parcels of the estate vineyard and were picked at a moment that would capture the aromatic intensity and crisp acidity of a cool-climate Riesling. Each lot was fermented separately at cool temperatures in stainless steel tanks to preserve varietal character and aromas. The wine experienced extended post-fermentation aging on light lees, which was periodically stirred back into the wine to increase body, roundness and aromatic intensity. The small batches were then combined into a harmonious blend that displays the complexity of each of its individual components. Availability. At our winery in Fairport; at selected wine and spirits stores and restaurants in New York State; at CasaLarga.com for direct shipment to residences and workplaces in 37 states. Accolades. Double Gold Medal (judges were unanimous), 2017 New York Wine & Food Classic competition. Aging. Store at cool temperature (55º-60ºF) and out of direct sunlight. This wine is produced to be drunk young, crisp and fresh, i.e. within 2 years of bottling. Tasting notes. Our crisp dry Riesling exhibits a light floral nose, bright green apple notes, and beautiful natural acidity. Pairing suggestions. Crab cakes, curries, fish served with lemon, and other citrusy and spicy dishes.